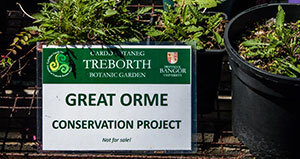 Great Orme Plant Conservation Project initiated by STAG in 2012 was established to conserve and celebrate some of the Great Orme’s most special flora. The predominant vegetation of the Great Orme is limestone grassland. However, pockets of heathland exist where soil of glacial origin has accumulated. Areas of limestone pavement, scrub and woodland occur as well as high sea cliffs. The grasslands, heathlands and sea cliffs are both nationally and internationally important and support rich communities of plants, insects and birds. Several species are of national significance. A number of Priority Species and Habitats of the UK Biodiversity Action Plan are found on the site. Most of the Great Orme is designated a Special Area of Conservation (SAC) as it contains habitats and species which are considered to be rare or threatened within Europe. It is also a Site of Special Scientific Interest (SSSI) and is included in both the Nature Conservation Review and Geological Conservation Review, indicating its national importance. By carefully upgrading the plant husbandry of all the relevant taxa we presently grow we have constructed a large limestone pavement within the present rock garden to accommodate some of the Orme’s special lime-loving calcareous grassland species.